Hops. They are ubiquitous with beer. Beer geeks rally around these resiny cones - it’s almost a source of pride to those in the craft beer culture. There seems to be a continuous ‘Arms War’ between prototypical American brewers – who can stuff more hops in their beers. Who’s beer can punch you in the face more with hop presence when you crack open a bottle or pull a draft. I came to the conclusion the other day that I’m actually really quite bad at identifying one hop variety from another. Sure, the citrus hops are easily discernable from non-citrus hops (i.e. nobles), but if I taste or smell an unknown beer, its like throwing darts at a board to pick out the variety – I know which wall to aim for, but otherwise I should just close my eyes and hope for the best. This train of thought cumulated in organizing a Single Hop Beer Experiment with my local homebrew club (RIFT). The concept is simple: gather a bunch of volunteer brewers and have everyone brew the same American Pale Ale recipe, but everyone use a different, single hop variety. When complete, go through a flight of all the beers side-by-side. The results will be (at least I hope) a good opportunity for our club members to pick out and identify the different flavor and aroma contributions of the different hops. (To make the tasting even more useful, consider having a hop summary sheet on hand tasters to reference - or if your group is really into it, use full data sheets). The particular challenge of this project is to make sure each beer is similar, with the only difference being the hop different hop variety used. This means the same malt bill, the same yeast, the same fermentation profile, etc. It also means normalizing each beer to have similar bitterness levels (a challenge given the varying alpha acids in the varieties). 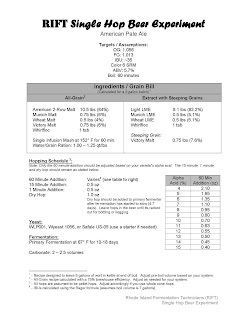 To make it as simple as possible for our volunteer brewers, all the IBU calculations were computed ahead of time (for a 4-15 alpha acid range) and the recipe/instructions listed below was distributed for our club's event (the RIFT Single Hop Beer Pale Ale Experiment). I should point out that the APA recipe is based on Jamil Zainasheff’s APA recipe from Brewing Classic Styles. 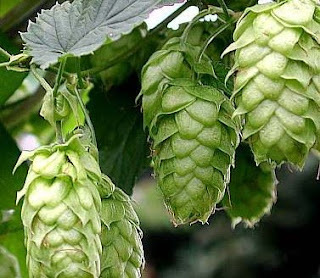 As of this posting, the following hop varieties have been 'volunteered for' and are being used in the different beers: Centennial, Amarillo, Cascade, Williamette, Northern Brewer, Saaz, Summit, and Mt. Hood. Note: Only the 60 minute addition should be adjusted based on your varietal’s alpha acid. The 15 minute, 1 minute, and dry hop should remain as stated below. Dry Hop: 1.0 oz Dry hop should be added to primary fermenter after fermentation has started to slow (4-7 days). Leave hops in the beer until it's racked out for bottling or kegging. - Recipe designed to leave 6 gallons of wort in kettle at end of boil. Adjust pre-boil volume based on your system. - All-Grain recipe calculated with a 75% brewhouse efficiency. Adjust as needed for your system. - All hops are assumed to be pellet hops. Adjust accordingly if you use whole cone hops. - IBUs calculated using the Rager formula (assumes boil volume is 7 gallons). Looking at the entire endeavor, a few pitfalls can be identified in the project’s concept. These ‘watch-outs’ are listed below in the chance anyone reading this post takes any guidance or inspiration for their own event. 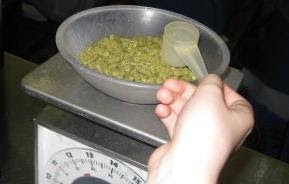 Hops used by homebrewers can vary in alpha acid content from what is labeled on the package (whether from age, crop variations, poor handling, etc). All the beer recipe programs have functions to model alpha acid degradation, but it mostly just a guess and a crap-shoot. Everyone’s system results in different hop utilization efficiencies. Put faith in your brewers that they have a feel for their systems and let them compensate where they think they may need to. Malt character in the beers may vary based on the individual’s mashing and fermentation equipment and/or process. The above recipe is hop-forward and tries to keep the malt characteristics in the background – the hope is the hop varieties’ character will overshadow malt character variations, allowing tasters focus on the contributions from the specific hop. Lastly, if anyone is interested in it, I’ve linked below an image of the instruction/recipe hand-out as a single page (click to get the larger version). If you would like a MS Word version of this document, please just shoot me an email. The results from the first Single Hop Beer Experiment done by the Rhode Island Fermentation Technicians can be found here. Additionally, the results from second round of Single Hop Beer Experiments can be found here. If you have any suggestions on how to make this project better, or have other ideas on exploring different hop varieties, please let us know!